When you hear the phrase “Snappy Goat,” a tasty ice cream sandwich may not be the first thing that comes to mind. But for Andrea Bowers, co-owner of The Custom Dairy Fairy with her husband Bruce, the Snappy Goat is the foundation upon which they built their ice cream business. And so The Custom Dairy Fairy was born. 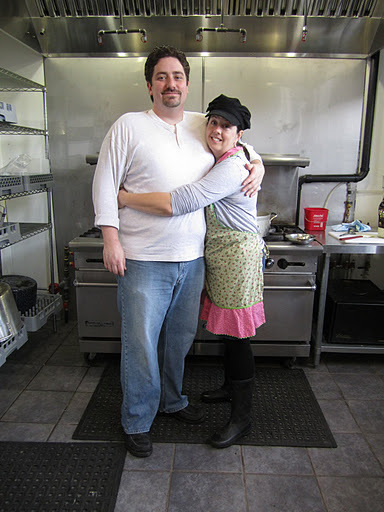 Andrea and Bruce, both pastry chefs, decided to turn their love for making ice cream into a business. Andrea took a food entrepreneurship class at Portland Community College where she developed the concept, packaging, and distribution strategy for her new venture. Through a unique partnership with Portland’s Culinary Workshop, Andrea is able to use their commercial kitchen to create all of the tasty treats. 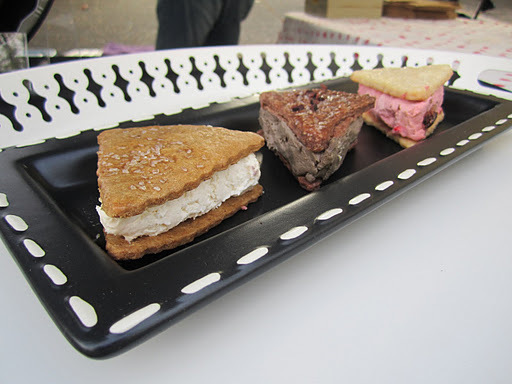 Consisting of lemon goat cheese ice cream held in place by two gingersnap pie crusts, the Snappy Goat is their signature sandwich. Their artisanal ice creams begin with a base from Sunshine Dairy, a local Portland business that sources fresh milk from family farms in the area. Andrea successfully worked with them to remove corn syrup from their product, so she now has a clean, blank canvas to infuse with her creative flavors. At a recent farmers market, offerings included Bourbon Hazelnut, Caramel Corn, Berry Tarragon, and Basil Mint, to name a few. Andrea gets inspiration from whatever she can find at her neighbors’ stalls at the markets. Sometimes she doesn’t even have to travel that far to be inspired: “I get basil from my own backyard,” she says. As the leaves change and the weather gets cooler, Andrea has an enticing lineup of fall flavors. During my October visit, she showed off her smoked caramel, cinnamon coffee toffee, and pumpkin chai ice creams. In a world where salty caramel has become increasingly prevalent (and I’m not complaining), smoked caramel offers a pleasant twist. Andrea achieves the “smoked” part of her caramel with a fire truck red smoker that her friends at Portland’s Culinary Workshop fashioned out of an old reach-in cooler. If your mouth is watering by now (I know mine is), you can find The Custom Dairy Fairy at Milwaukie Sunday Farmers Market and St. Johns Farmers Market. “There is no scoop shop in the plans as of yet,” explains Andrea, but you can bet that when people start catching onto these delectable treats, she may have to tweak her business plan. 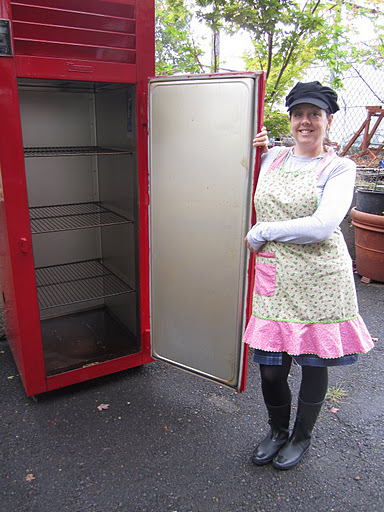 This entry was posted in Food Warrior Interns, In the Pantry (food artisans) and tagged food warriors, gina lorubbio, ice cream, ice cream sandwich, portland, portland's culinary workshop, Real Time Farms, snappy goat, the custom dairy fairy. Bookmark the permalink.